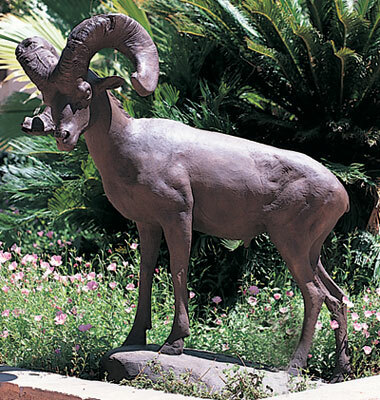 Whether in a private garden, museum, bank, hotel or restaurant, it is quite likely you will find yourself marveling at bronze sculptures during your stay in Santa Fe. These works of art are an integral part of the beauty and spirit of the city and there is no better place to enjoy bronze sculpture than by taking a walk up Canyon Road. Canyon Road begins at the corner of Paseo De Peralta and Canyon , and it is here, in front of Medicine Man Gallery that Veryl Goodnight’s monumental sculpture, The Bronc, can be seen. 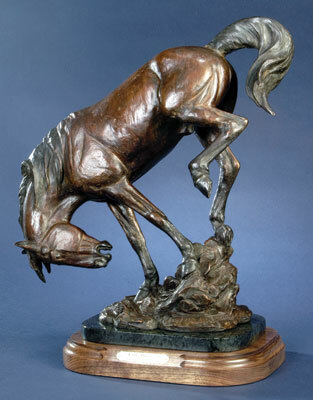 Veryl has been sculpting since 1973 and is one of the foremost equine sculptors in the United States. Descended from Charles Goodnight, the legendary Texas cattle baron, Veryl’s works reflect the American West and the pioneer ideal. She works exclusively from live models and has a special stage in her studio for the animals. Behind The Bronc is Susan Kliewer’s Maria of San Ildefonso. 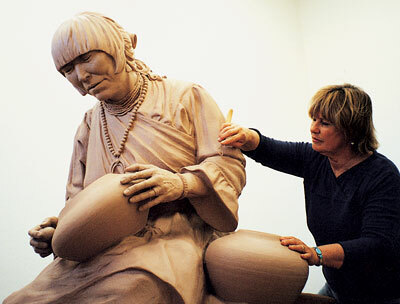 This monumental bronze commemorates the life and work of one of the most influential Native American potters who ever lived, Maria Martinez. Perfectly portraying Maria’s serene spirit, Kliewer shows the artist at work, finishing her exquisite pottery. Susan, a native of California, spent five years at the Marble Canyon trading post in northern Arizona adjacent to the Navajo reservation. Outstanding examples of Maria’s pottery along with Kliewer’s sculpture of Julian, Maria’s husband and artistic companion, can be seen at Medicine Man Gallery. In August, the gallery hosts an annual show and sale of Maria’s work, and collectors from all over the world attend. Take a step further and inside the gallery you will find an impressive collection of bronzes by some of the West’s best known sculptors, including artist couple Fred Fellows, CA and Deborah Copenhaver-Fellows. 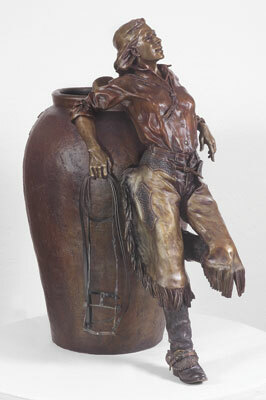 Sculptress Deborah Copenhaver-Fellows often creates bronze pieces of women riding horses. Her love for the quote ended up being incorporated in one of her bronze works of a cowgirl at rest (She Rode Good Horses). The quote is not just a source of inspiration for sculpture, but for Deborah, it is a reflection of her life. Fred Fellows, two time past president of the world famous Cowboy Artists of America and one of the few artists to win gold and silver medals in both painting and sculpture, is passionate for the cowboy way of life. 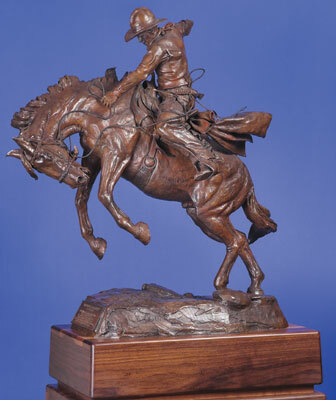 Fellows’ sculpture, An Honest Days Work, portrays a real 1880’s working cowboy whose inscription reads, “In the vast reaches of the American West the work ethic still exists. Fellows is an unique sculptor, ensuring the most minute details of his works are historically accurate. Fred even had a custom stamp made to replicate this sculpture’s authentic 1880’s saddle. 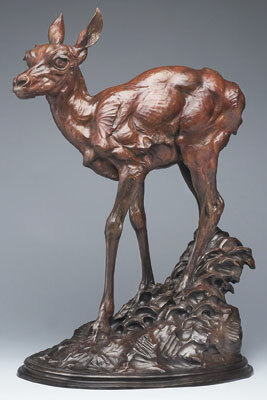 Complete your gallery tour by enjoying a wide assortment of wildlife sculpture. Bears, bull elks, coyotes, big horn rams, and even a life size jack rabbit are on display. Jan Mapes’ inspiration for her artistry is the direct result of living a traditional western lifestyle. Through this daily exposure, she has developed a feel for nature and animals that is evident in her work. Jan strives to capture the movement, flow, and emotion of the moment. Mark Rossi’s interest in nature and art emerged at an early age. When he was ten, he began observing his father, prominent western artist and former Gilcrease Museum of Art director Paul Rossi, as he worked in his studio and foundry. With humility and humor, Rossi allows the viewer to observe a quiet moment in the life of the subject he sculpts. Richard Loffler’s first experience with portraying animals came while working as a taxidermist for the Royal Saskatchewan Museum. 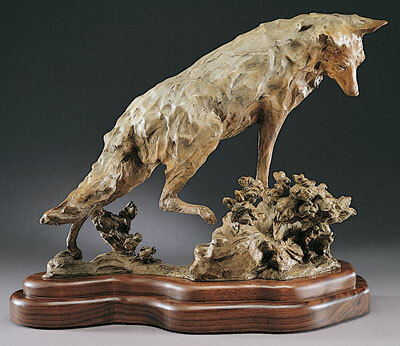 The process of rendering animals accurately struck an artistic chord for Loffler, and he began to experiment with sculpture. Although he gained a great deal of knowledge about the anatomy of animals from taxidermy, he set out to zoos and outdoor places where he could observe animals, their actions, characteristics and movements. His outdoor work paid off, eventually allowing him to devote his full time to sculpture. Savannah is a beautiful example of the combination of Loffler’s understanding of animal anatomy and environment. This article was excerpted from Canyon Road Arts: The Complete Visitors Guide to Arts, Dining and Santa Fe Lifestyle, Vol 1, 2005-2006, pages 84-87. Canyon Road Arts is published by Medicine Man Gallery. All rights reserved.